We went to Cameroon once. After a year in which we hardly dared imagine how it might be outside our imagination in case plans didn’t come to fruition, we went to Cameroon. With six weeks of the pace and vivid colour and lessons of Kenya in our minds, and so tired that everything was moving in slow motion, our first glimpse of the country, rushing at us through the clouds over Yaoundé, was an impression of green that settled somewhere above our stomachs and stayed there. We drove away from the town and the trees got taller, the biggest rising like sentinels, stark against the loaded white of a sky ready for rain. As the road turned into mud, everything human shrank and everything green got larger, and when we stopped in the forest it was incredibly noisy and incredibly peaceful, all at the same time. Over the chimpanzees and gorillas, the monkeys in the distance, and the ever-present cicadas, we shook off the mantle of sleep and remembered our smiles as we met the people who would become our friends. 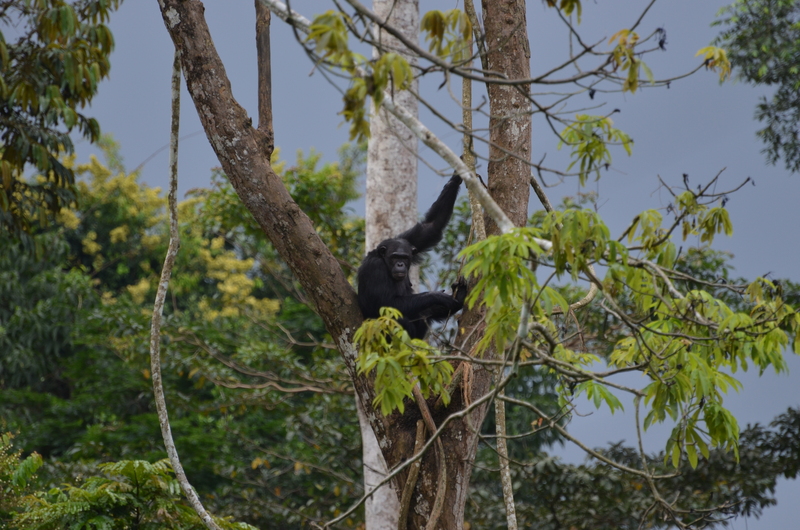 After a few days, we knew that the sound of gorillas chest-beating stops you in your tracks, and that watching chimpanzees playing turns minutes into happy hours. We knew that every insect wanted to bite us and our clothes would never dry, but that none of that mattered. We knew that a baby chimpanzee, like a baby human, will carry out the same activity until everyone else has long lost interest, happy in her own world and oblivious to the fact that she is melting your heart. After a couple of weeks, we knew that a six month old mandrill previously kept as a pet would cling to any human with heartbreaking desperation, and that to say his eyes were anxious did not feel like anthropomorphism. We knew that sometimes, gorillas lose the will to live and that all you can do is watch them give up, and we felt the quiet, abiding hurt that caused in those who’d seen it happen. We knew that chimpanzees, though they may not give up, sometimes take their trauma and turn it on themselves, carrying it to adulthood. Above all this, though, we knew that there was hope, because we saw it in the groups of chimpanzees or gorillas playing normally together, and in the way the animals melted into the forest to carry on without us. When we had to leave, we knew we had been privileged and that goodbye was going to stick in our throats. We had met some of the very best kinds of people, and had seen what caring can do. We carried away with us stories of days and nights spent nursing apes through unimaginable traumas, of families seldom visited, and of simply not knowing this is a special thing to do, because why would you do anything else? We took the serious expressions of school children learning about forests, and the shriek of chimpanzees excited about everything because it just is, and the image of primates in a forest out of harm’s way, and put it carefully away where it could continue to inspire. We knew we had seen something special in those peaceful, challenging, heartening and heartbreaking weeks, hidden in the green space that felt like home. This post is dedicated to Ape Action Africa, whose people and animals inspired it. www.apeactionafrica.org. ← Snapshots from the best year yet. Beautiful, it really is a special place and your writing is really touching.